Like an impromptu trip out in Uncle Jimmy’s Silver Shadow, this game began full of nervous excitement for Southampton but quickly descended into bewilderment and dismay after 13 minutes of frenzied attacks. This Everton, as we have established, are kind of boss when they field a full strength side and take matches seriously. However, for all their brilliant football, which is attracting praise from all quarters, it does always feel as if it can be undone by the most straightforward attacks from less sophisticated opponents. At times we are almost like the fella with the twirly sword who Harrison Ford shoots in Raiders of the Lost Ark. Newcastle showed that, Swansea threatened to at times, and Southampton opened the scoring at Goodison when Gaston Ramirez, totally unmarked in the six-yard box, headed home a deep corner that somehow completely deceived Tim Howard despite the rather honest nature of its back-post loopiness. The rather likeable Nigel Adkins, who always looks like he is on the verge of casually mentioning ‘when Christ first spoke to him’, did his homework and decided that the best course of action was to push up on the centre-halves and try and force Everton to ‘go long’ as often as possible. As a result, the Toffees struggled to settle into any early rhythm and could have easily gone two down when Jay Rodriguez simply outpaced the horrible slow Johnny Heitinga in pursuit of a punt downfield, only to slide his low shot narrowly wide. Southampton looked genuinely ‘lively’ then, and to say that Leon Osman’s opening goal on 25 minutes settled the crowd’s nerves would be something of an understatement. Adkins admitted that the Saints’ biggest worry was about the threat of Leighton Baines and Steven Pienaar down the left, but it was on the opposite flank where the damage was done. Kevin Mirallas and Seamus Coleman showed endless pace and endeavour throughout and it was the Belgian’s wicked cross that narrowly eluded the returning Nikica Jelavic only to drop perfectly for Leon Osman to plant a shot into the roof of the net. After that, Everton were unstoppable. On 32 minutes Mirallas picked up a ball deep in his own half, played a one-two with Marouane Fellaini and then slipped a pass through for Jelavic who, rather atypically, drove into the box and placed a low, left-footed shot across Paolo Gazzaniga, finding the bottom corner of the net. File under ‘clinical’. Six minutes later Jelavic scored his second with the sort of finish we are more accustomed to seeing from him. Coleman did brilliantly, taking the ball from a throw-in, pushing it past the defender on one side and running around the other before hanging a cross up to the back post. Yes, that does sound quite Lawrenson, but there’s only so many ways of describing this stuff without the occasional cliché creeping in. Jelavic’s powerful header from an awkward angle was over the line before Gazzaniga, bucking in the air like a hooked marlin, got a glove on it. In fairness to the young keeper he made a number of decent saves, leaving the visitors at least a glimmer of hope throughout the second half. Who knows, if Ramirez hadn’t put the ball just wide after neatly lifting it over the exposed Howard, or Ricky Lambert’s header had drifted just the other side of the post, there might still have been a nervy end to a match in which Everton were once again the better side by an enormous margin. It’s difficult to know whether we are actually conceding more chances than usual at the moment or whether it’s more that we are so dominant and playing such attractive football that whenever the opponents get a sight of goal it stands out because it just seems downright unfair now that they could actually score. Thankfully they never and the Super Blues now sit a rather resplendent second in the league. It’s pointless speculating about where it will all end in terms of league position because there is so much of the season left to play and far sterner opponents to face than Swansea City and Southampton. Just enjoy the present aceness for what it is. Which is ace, obviously. Quickly, going back to Jimmy Saville, if there’s one serious lesson that must be taken from this whole sordid episode, it’s that if someone looks like creepy old nonce case then they almost certainly are. Some have said that it’s just a shame that he is no longer around to face these accusations, but that doesn’t mean we can’t do the next best thing. Who is up for throwing a brick through the window of Stoke Mandeville? 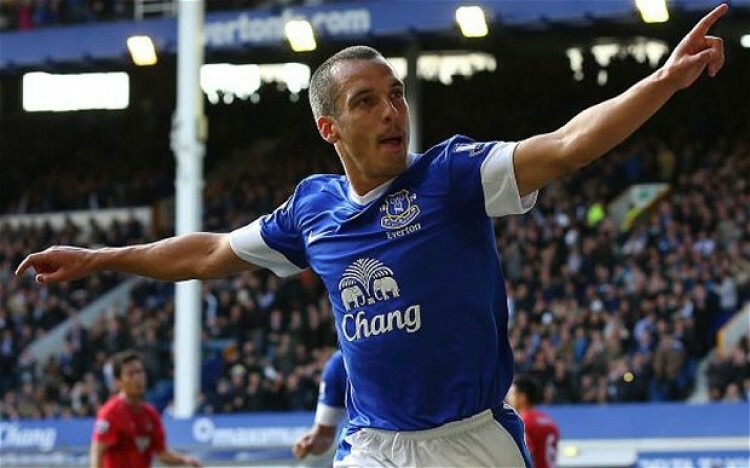 Posted on October 1, 2012 October 10, 2012 by mob1971	This entry was posted in Match Report and tagged Everton, Jelavic, Kevin Mirallas, Moyes, Osman, Southampton. Bookmark the permalink. carlsberg dont write opening paragraphs, cos they concentrate on brewing pissy ale and know fup all about english. So you won that one. “bucking in the air like a hooked marlin” Lovely. Nothing Lawrenson about that. Splendid as ever, Mark – I particularly enjoyed your radical assertion that Nigel Adkins is “rather likeable”. Social network habitués would have me believe that he is the Devil incarnate because of his slight Wirral accent and his mild punctiliousness.